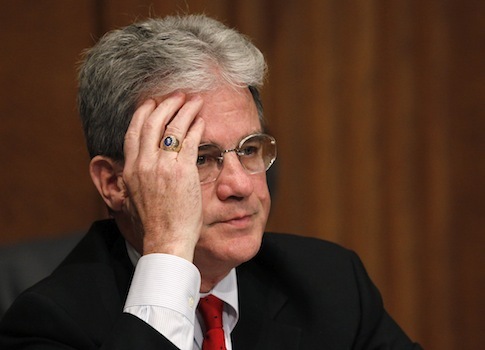 Sen. Tom Coburn’s (R., Okla.) annual Wastebook was released Tuesday, detailing billions in frivolous government spending on everything from wine to romance novels. As the federal debt surpassed $17 trillion in 2013, Coburn’s office named its top 100 examples of government waste, which cost taxpayers more than $30 billion this year. "When it comes to spending your money," Coburn wrote, "those in Washington tend to see no waste, speak no waste, and cut no waste." The examples are numerous, including a $150,000 zombie game created to teach kids math and $40,810 to hire an Inventory Manager at the "Denver Museum of Miniatures, Dolls and Toys," which features exhibits on miniature trains, and giant teddy bears. The 167-page report compares the Obamacare launch to "New Coke," tallying the total cost for the glitch-ridden website and promotion for the law at $379 million. Coburn uses the $319 million figure for Healthcare.gov—the most conservative estimate for the cost to build the website—and $60 million for advertising. The $10 million Oregon received to push the law includes advertisements that do not even mention the word "insurance." However, the Portland advertising agency North, Inc., did produce a psychedelic cartoon ad that "features what appears to be Gumby riding on the Beatles’ yellow submarine" to promote Cover Oregon. The Oregon marketplace had only enrolled 44 people as of Nov. 30. Other federally funded advertising campaigns have not proven much more successful. "Colorado’s $20 million Obamacare campaign, which features an Elvis impersonator, has signed up fewer than 4,000 enrollees including one dog named Baxter," the report said. The National Endowment of the Humanities (NEH) spent nearly $1 million to promote romance novels, including a $616,000 documentary "Love Between the Covers," a website, and a traveling exhibit. The $914,000 grant was meant to "explore the fascinating, often contradictory origins and influences of popular romance as told in novels, films, comics, advice books, songs, and Internet fan fiction, taking a global perspective—while looking back across time as far as the ancient Greeks." The website recently asked if Edward from the Twilight series was "romantic or controlling?" Other examples of misguided government spending included $1.9 million for "lifestyle coaching" for Senate staff and $1.5 billion for the maintenance of vacant federal buildings. The Justice Department spends $626,250 so its employees can use travel agents instead of booking online, and the Postal Service paid "futurist" Faith Popcorn $836 an hour for advice on the future of stamps, amassing a bill of $566,000. Sixty-five million dollars in intended Hurricane Sandy relief went to tourism ads, while only one victim to date has received housing assistance in Staten Island. Funding also went to research projects that study duck penises ($384,989) and how to use human urine as fertilizer ($15,000). The Wastebook noted the results of a similar project: "A 2007 study conducted in Finland … found cabbage fertilized with urine grew faster and larger but that sauerkraut produced from the cabbage grown in urine tasted different." The U.S. taxpayer also subsidized a hefty amount of alcohol production in 2013. The Alaskan Brewing Company received $450,000 for a "new environmentally friendly boiler," $200,000 was spent to double production at a winery in Oklahoma, and $100,000 went towards a distillery that makes yam vodka in North Carolina. The report also focuses on waste in the Pentagon’s budget, including a $9 million reality television series for the Army and a $34 million military headquarters in Afghanistan that will never be used. The Department of Defense also destroyed $7 billion worth of useable military equipment in Afghanistan rather than selling it or shipping it home. Another target is NASA, with the report finding over $4.1 million in wasteful projects over the past year. While no manned missions to space are planned, NASA spent $360,000 paying people to "lie around and do nothing" for a study on weightlessness in space. The agency spent $3 million for a seminar on "how the legislative process really works" in Congress; $237,205 to study red crabs; and $390,000 to create a cartoon superhero, the "Green Ninja," to teach children about global warming. The character fights his archenemies "plastic man, coal man, and junky corporate man." "These are only a few of the 100 examples of government mismanagement and stupidity included in Wastebook 2013," Coburn writes. "Collectively these cost more than $30 billion in a year when Washington would have you believe everything that could be done has been done to control unnecessary spending." "Had just these 100 been eliminated, the sequester amount would have been reduced nearly a third without any noticeable disruption," he said. This entry was posted in Issues and tagged Government Spending, Government Waste, Obamacare, Tom Coburn. Bookmark the permalink.